This year, NEYA inducted 13 entrepreneurs into our Lifetime Achievement Hall of Fame. These individuals took their place among 33 other entrepreneurs who have been recognized with this special recognition since 1994. 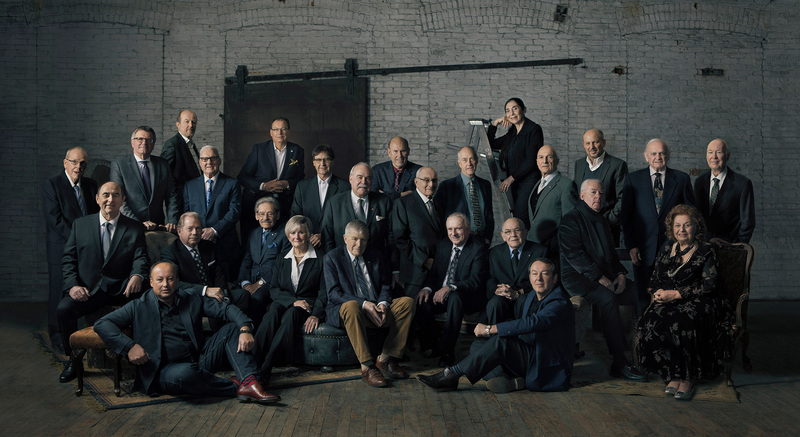 In celebration of NEYA’s 25th anniversary, we invited this accomplished group to sit for this commemorative portrait. Special thanks to photographer Robert Nowell for working with us to capture this incredible image which was shot in the former Lincoln Fabrics factory in Port Dalhousie. We were grateful to receive permission from Sheldon Rosen of the SDR Group to access this historic building, and honour the memory of the late David S. Howes, Lifetime Achievement Award alumni (2012). Thanks also to the Shaw Festival’s props department for their kind assistance with this project. We also honour the memory of these Lifetime Achievement Award Alumni: Louis J. Cahill (1996), Roy Cairns (1995), Jan R. Cook (2015), Paul De Divitiis Sr. (2018), Ken Fowler (1995), Edward J. Freeland (1994), John Holer (1996), David S. Howes (2012), Adriaan Olsthoorn (1999), Dr. Joseph Peller (2000), Abraham (Ed) Regier (2003), John Walker (2011) and George Wakil (2004). Dates noted above indicate year award was bestowed. Thanks to our sponsors at YourTV Niagara and En Pointe Creative for capturing the story of the making of this very special portrait.